At LA, I also picked up this gem. (In the 30ml nagelene bottle) I say "gem" because of it's insane pink sheen. You can see some of the pink sheen on inky here, but in reality it's much stronger. The ink sploosh. Again, the color is much bluer than real life. I noticed that this ink is WET! It may be the wettest ink I've ever used. I don't know if I appreciate that, as my pen (an old Conklin with a feed designed for IG inks and flex nibs) is already a gusher. It sheens crazily, but also smudges quite easily on ink-resistant paper- the I blame the blue marks seen on the Maroon review on this, as they were on the same page and went in the scanner together. Behavior on lesser papers is the usual - it spreads and bleeds (due to sheer wetness) a bit, but does not feather. Water resistance is also minimal. Paper from Daiso Notebook (bluecover);very thin but very ink resistant, and makes anything sheen on it (with glacial drying times). Quite a strange paper. Thanks for an excellent review. I'm a huge fan of the Blackstone Inks. Fantastic review od great ink. 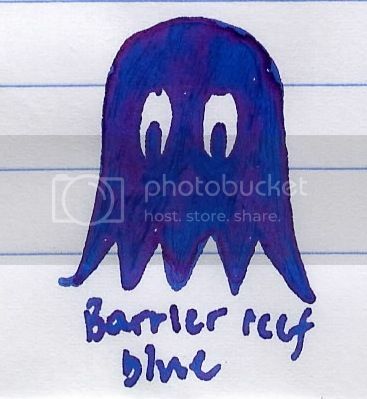 Just today, I received a letter from a correspondent, part of which was written with Blackstone Barrier Reef Blue. 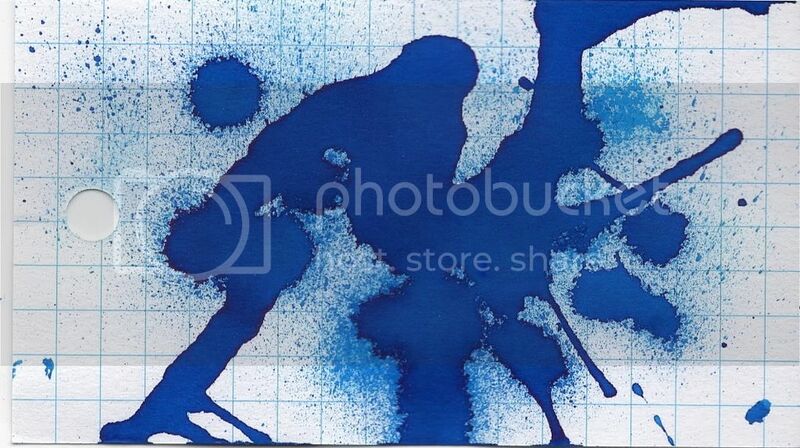 I was amazed at the sheen of this ink! I don't usually get worked up about sheen, but this was just beautiful. I immediately started trying to find it, but the only seller I can find in the US is Anderson Pens, and they are out of stock. Is there another source without paying outrageous shipping charges?